These bars are light, moist, and flavorful, perfect for dessert or a snack. If you like, after adding the flour mixture you can stir 1/2 cup currants and/or 1/2 cup chopped pecans or walnuts into the batter. Be aware though, that chunkier bars may be harder to cut with a cookie cutter. Using your favorite Ann Clark cookie cutters, cut shapes from the pan of bars and use a pancake turner to gently lift each shape from the pan. Place the pumpkin bars on a wire rack set of a baking pan. 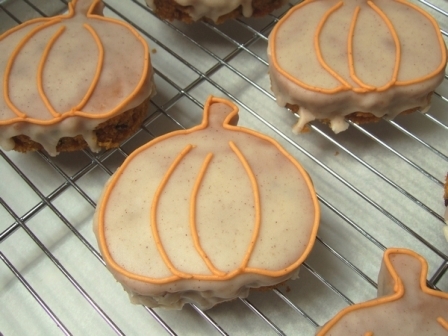 (If making pumpkin shapes, you may need a butter knife to help getnly push the "stem" from the cookie cutter.) Place 4 tablespoons unsalted butter and 6 tablespoons heavy cream in a microwave safe bowl and microwave until the butter is melted. Whisk in 2 cups confectioners' sugar, 1/2 teaspoon pumpkin pie spice, and a pinch salt. Pour a generous spoonful (about 1 1/2 tablespoons) over each bar, using a small spatula if necessary to spread the icing to the edges. It's OK if glaze drips down the sides of the bars. If glaze becomes too hard, reheat gently in microwave and stir. Let glaze set before serving.